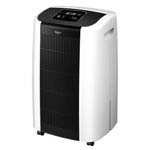 Best dehumidifiers for basements. Which should you choose? 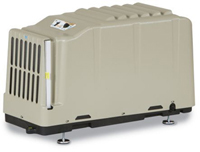 Dehumidifiers for basements come in many shapes and sizes. Choosing one for your basement can be confusing. If you make the wrong choice it can be expensive. This brief guide will help you to steer a course through a mass of misinformation and sales talk. Along the route I will provide sign-posts to other useful pages you may find helpful. Among these are reviews of many units you may wish to consider. I make recommendations in favor of the brands I trust. I base that trust on what the people that use them have to say about the appliances they use. I also provide general information to help the non-expert to understand what various terms mean and why they may be important. You will find links to these pages too and you may visit the ones you think will be useful. Whatever your final choice I know that it will be a major expense for you, not only to buy but also to run your appliance. The old saying, "act in haste, repent at leisure", was never truer than for people choosing dehumidifiers for basements. My aim is to help you to get it right, first time, and to be happy with your decision. I have tried to provide all the information you need about dehumidifiers for basements but, if there is something I haven't covered, please feel free to ask a question. A link to the "Ask a Question Page" is in the right hand column of this page. Your question and the answer will be published here. If you provide an email address I will let you know when it's ready and where you can find it. Dehumidifiers for basements must have enough water extraction power for the space in which they are working. A wet basement needs more moisture removing power than a drier basement. See our page about sizing your appliance for more details about how to make sure you choose a model that is powerful enough. This is perhaps the most important question of all. For a typical, refrigerant unit anything below 65°F is "cold". Below this temperature ice forms on the evaporator coil and the appliance cannot operate. A standard portable, such as a Frigidaire FAD704TDP, simply stops sucking up water and waits for the air flow from the room to melt the ice. This is called "auto-defrost". The cooler the air the more quickly the ice forms. The cooler the air the longer the ice takes to melt. As the dehumidifier spends more time defrosting and less time removing water from the air it becomes less and less effective. Auto-defrost by itself does not make a portable suitable for low temperature operation. If your basement is cooler than 60°F for lengthy periods a portable model should not be on your list of dehumidifiers for basements. If you do choose one for a cool basement you will find that it struggles to maintain a level of relative humidity of 50% and that it runs for all or most of the time. The result is it quickly burns itself out and uses masses of expensive energy. I am not pulling my punches here because I don't want you to join the thousands of others who have worn out as many as three or four portables in five years at $200 to $350 a time, and used at least twice as much energy as they needed to, before investing in a purpose built basement dehumidifier. A portable model is a very poor investment for a cool basement! See our page on evaporator coil icing for more information. When can portable models be used as Dehumidifiers for Basements? The simple answer is if your basement is not too large and it is at least 60°F for all or nearly all of the year. If your basement is large enough to need two portables it will be cheaper to run a single, purpose built basement model. They last longer, are much more energy efficient and run for fewer hours. Their life-time cost will be less than the two portable units, and the two you bought to replace them, and the further two you bought...I guess I've made my point. You may find our page about the costs of running these machines helpful. If a portable model will be adequate for your basement I recommend the Frigidaire FAD704TDP or the Danby DDR7009REE as two of the best choices for performance and reliability. Another model I recommend is the Winix 70 Pint WDH871. 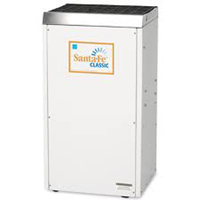 Although this is more expensive than the Frigidaire and the Danby it is not only one of the best available but also has an integral condensate pump with a 15 foot vertical lift capability. If you do not have a suitable, floor level drain for continuous drainage a separate pump will cost between $40 and $80. Which Dehumidifiers for Basements Perform Well in Cooler Conditions? Because cool areas place more severe demands on a dehumidifier the units designed to work in these conditions have to be built to a more exacting specification. Suitable models, designed for use in the home, are built therefore to commercial standards. Inside them you will find a bigger, more robust fan and a tougher, more capable refrigeration unit (condenser and evaporator coils and compressor). On the outside the appliance has a durable metal casing in place of the plastic used on portables. The superior components make these units exceptionally energy efficient and enable them to operate at lower temperatures. All of those designed for basement, crawl space and whole house use will operate effectively at temperatures as low as 55°F and some will be as effective down to 45°F. 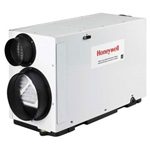 These may be described as basement, crawl space or whole house dehumidifiers. The basement and crawl space type all operate as stand-alone units. The difference between the two types is simply that the basement type is taller in relation to its width/depth while the crawl space type is lower and relatively longer, to fit within the limited head-room of a crawl space. While you can't use a "basement dehumidifier" in most crawl spaces all crawl space units are suitable for use as dehumidifiers for basements. The choice will depend on capacity, and where you want to locate it. Most are equipped for ducted operation so if your basement is partitioned, or even if it is simply very large, you have the option of ducting both the input and output air flows. The whole house type is designed to be integrated with your HVAC system to serve, as their name suggests, the whole of your home. All, by definition, can be ducted but some can be used in stand-alone mode and may be used as dehumidifiers for basements. 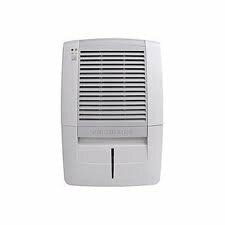 For an overview of which can be used as dehumidifiers for basements, and links to my reviews of them, visit our page about basement models. As well as those built for home use but to commercial standards there are, of course, commercial and industrial models which are not designed for home use as such but will be effective as dehumidifiers for basements. For most folks choosing one of this type is a step too far. They are, on the whole, more expensive to buy as they are engineered to withstand even tougher conditions than will be found in a cool basement. The type most often bought for home use is the designed for water damage restoration. These are specially designed for use by specialists to dry out buildings after severe inflows of water. Because of the nature of their work, water damage restoration specialists need unusually robust equipment that can be transported from site to site and stored in the minimum of space when not in use. The storage requirement means that many of these units are stackable, in layers, so need a strong external casing. Some of these units are described as "LGR" (Low Grain Refrigerant) which means that they can extract a higher proportion of water from the air than the "conventional" type. In most basements there is no need to maintain a relative humidity level below 45%, a level which basement, crawl space and whole house units will achieve with ease. For this reason we do not recommend these for general use. They are too expensive and more than most folks need. 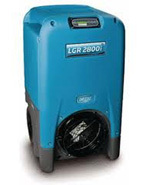 In exceptional circumstances, such as a basement used exclusively for storage and containing items which require an unusually low humidity level, you may wish to consider water damage restoration units as dehumidifiers for basements. Another exception is where your basement gets very cold, just above freezing point, at certain times of the year. Many Water Damage Restoration units, including the two illustrated on this page, are capable of operating at temperatures as low as 33°F. This exceeds the capabilities of any appliance built for use anywhere in the home. 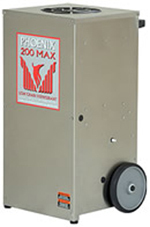 For more information about water damage restoration models please visit our pages describing Dri Eaz and Phoenix products. Finally, if you do decide to invest in one you will have concluded that dehumidifiers for basements are not cheap. You will want to be sure that whatever appliance you choose is doing the job you bought it for. It may be a wise decision to add a hygrometer, a humidity measuring device, to you shopping list, particularly if you are relying on a standard portable model. If you would like a little more information please see our introduction to hygrometers here.